Gun Free Zones are hunting preserves for innocent people. If you decide you aren't interested in being part of that preserve, then what kind of weapon do you need to stop a bad guy? Not much, really. You could use a cross bow, but the damn things are hard to conceal. There are all sorts of lists of nice concealed pistols out there. My suggestion is that you get something that will fire a shot filled round in addition to regular ammo. Why? Makes it harder to miss the bad guy and makes it harder for a stray round to take out a fellow innocent. The most efficient handgun for shooting .410 shells would have a smooth-bore barrel sized to fit that shell only. However, sawed-off shotguns and smooth-bore pistols have been restricted in this country for some time due to NFA regulations established in 1934. In order for a handgun to qualify for over-the-counter sale without additional Federal tax stamps and paperwork, it must have a rifled barrel and be chambered for a center-fire cartridge intended for handguns or rifles. See the handy info from 410Handguns.com here, which serves to point out that shot shells are a mostly a close up and personal thing. Then again, personal defense is all about up close. 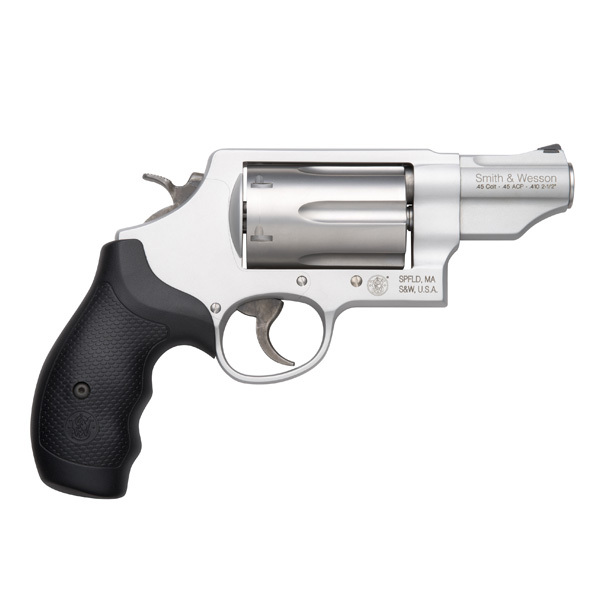 The Smith & Wesson Governor revolver puts six rounds of customizable response under your control. Load with .410 2 1/2" shotshells, .45 ACP or .45 Colt - alone or in combination - and hit your target in every situation. That's where you learn the kind of gun control that matters. Oakland University criminal justice professor Daniel Kennedy couldn't agree more. He told the Detroit News that terrorists would be reluctant to attack armed citizens. Which is a cowed population willing to accept anything to stop the terrorists, including meekly surrendering. Saying that terrorists would be reluctant to attack armed.... is not quite right. They do it just about everyday in Jihadistan because for them, it is but a brief stop on the way to Paradise. They know they're going to die. It's not reluctance to face armed enemies that deters them or makes them attack soft targets. Their attacks are motivated by the NEED to cause TERROR. Look at Beslan and other attacks/bombings. It didn't matter who was killed. The object was to terrorize in line with the terror doctrine out of the 60's. Force the state to repress even more of their fellows who will then lash back at the state in a vicious cycle. You are right to a point. That point being that a group that is ready, willing and able to fight back is not, almost by definition, a terrorized and cowed group. Terror is a state of mind that admits helplessness and hopelessness against an enemy who, as you indicate, is more than willing to die in his cause. But if an armed citizenry has the power and will to fight back then it is unlikely they are subject to that terror that causes paralysis. As far as repression of their fellows, it seems that is preventable if the non-jihadist majority would assist in identifying those who are disinclined to practice peaceful co-existence. Saturday Is Old Radio Day: "A Christmas Carol"
Why Do Some People Become Terrorists? North Korea: Oil and Gas Powerhouse? The Great Nicaragua Canal Project: "On Hold"